Note: I wish I could take credit for planning a Netflix column on the perfect weekend for watching Netflix but the appropriateness didn't occur to me until the night before the start of the blizzard. Hope everyone is warm, secure, not needing to go anywhere, and have power and Internet to watch Netflix. For the snowbound who are not Netflix subscribers, they do have a 30 day free trial. Netflix has become a force of nature. It is credited with the downfall of the video store – even mega-giants like Blockbuster, when its primary business was mailing DVDs. Netflix has more than 70 million users worldwide. This is bound to grow dramatically, as it recently announced 130 new countries will soon have the streaming service. Netflix’ streaming service has changed the way many people watch TV. Who binge watched entire series before Netflix? Now people think nothing of sitting down on Saturday morning and cranking through entire seasons of a TV show in one sitting. One huge frustration with Netflix is finding something to watch. Netflix does not have a category showing you all the movies. It recommends genres to you and shows you movies in them. After you have watched a few films, it recommends others based on your viewership. There’s a search function. So if you know a film you want to watch, you can find it. Unfortunately, most films that come to mind are ones that were recently in theaters. Films show up on Pay For View on your cable channel or on DVDs at Redbox or Netflix DVD service long before, or even if, they appear on Netflix streaming. I enjoyed “Galaxy Quest” the other night after reading obituaries for Alan Rickman. If it hadn’t been for the reminder, I might not have thought to re-watch that delightful parody of “Star Trek” and its rabid fandom. Recently, I learned of an article Alex Madrigal wrote in “The Atlantic” almost two years ago about an interesting thing he noticed about Netflix, and his quest to learn more. He noticed that if you are logged into Netflix on your PC and chose a genre, let’s say “TV Action and Adventure,” your browser goes to a page whose URL is “http://www.netflix.com/browse/genre/10673.” Notice the number at the end. That intrigued Madrigal, so he entered another number and found another genre. He wrote a script to cycle through all numbers and while many were blank, he discovered Netflix had 76,897 sub-genres. Do want to see Cerebral Movies based on Books or Critically Acclaimed Mind Bending Movies or Witty Mockumentaries? They're all out there if you know the number for the end of that URL. In this week’s Link Post at FamilyTechOnline.com, I have a link to a list I found with these and many more genres. You will easily lose yourself bookmarking movies. Not every genre has movies in it. Some genres may have films only licensed for other countries, or movies that Netflix no longer has a license to show. Once Netflix, or any streaming service for that matter, licenses a film, they do not have the right to show it forever. Movies come and go on Netflix. There is nothing more infuriating than to start watching a series and have it disappear from Netflix before you finish all the episodes. On the other hand, knowing what is new may lead you to something you want to see. Unfortunately Netflix does not have a category for content about to disappear. InstantWatcher.com has the best search engine for Netflix and Amazon movies. Can I Stream It? and such sites let you enter a movie and find out where it will be streaming on Netflix, Amazon, Hulu and others. Or it will tell you if you can purchase or rent it on Amazon, iTunes or Google Play. Or, it will tell you if you can stream it on a smartphone app. I also like the Fan TV app. It does the same as Can I Stream It? but has more information and trailers. Following the recent attacks in Paris and San Bernardino, California, some politicians are again trumpeting the need to give law enforcement access to all encrypted messages. The theory is, if we could read the texts and email terrorists send and receive, we would know their plans. A law would require makers of encryption products to build a backdoor into their software that law enforcement would access. FBI Director James B. Comey has long advocated law enforcement be given this tool. The New York Times reported recently it appeared Comey had lost an internal struggle within the administration to force Apple, Google and others to decode messages for law enforcement. It is unclear how, or even if, security software made in other countries could be compelled to provide backdoors to U.S. law enforcement. The easiest way to understand how this might work is to look at a physical system. The Transportation Safety Administration requires the ability to unlock suitcases for security inspections. There are luggage locks that give you a unique key to your lock, but also allow a TSA master key to open the lock. This is the best of both worlds, theoretically. Only you and the TSA can open your luggage. At first glance, giving this same kind of protection to digital suitcases (i.e. messages,) seems like a no brainer; let law enforcement read messages, but keep others out. There is another side we need to consider. Security experts tell us that if you open a less-secure backdoor for law enforcement, others might use it too. We have to look again at the TSA-approved locks to see how this might transpire. A photograph of the keys ran in the Washington Post. Turns out that’s all you need to duplicate them. Google “TSA Luggage Keys” and you’ll find people selling the keys and even files you can download so your 3D printer can make them. If there is a backdoor for law enforcement in encryption products, experts fear they too might be discovered by the bad guys. Just as luggage keys leaked, backdoor technology may leak, or simply be discovered by hackers. Recently Juniper, maker of firewalls that are designed to keep digital data safe from hackers, discovered someone had inserted a backdoor into their product. Juniper firewalls are used to protect commercial and governmental data, so there was a real potential that bad guys had gotten data we did not want them to have. The NSA is one of several suspects of who actually spied on traffic through Juniper devices. The Wired article is cited in this week’s Link post at FamilyTechOnline.com. Too many in the public do not know they themselves depend on encryption. Certainly you do not have an encryption app on your phone or PC, nor do you have to encrypt or decrypt your email before you send it. Our phones and computers encrypt and decrypt data for us on the fly, invisible to us. When you shop at Amazon, HTTPS encryption encrypts your credit card information while it is in transit. Someone “listening” in to Internet traffic between your PC and Amazon would not be able to read your credit card number. Look at the address bar in your web browser. If the address begins with HTTPS then you are in an encrypted conversation. The same happens when you log into your bank. More and more sites are using HTTPS security by default. Even this column is encrypted before Google Docs saves it to its server. We could not do business, banking or review our medical information securely without encryption. It is a mainstay of online commerce. And the fact is terrorists would simply communicate using other secure means if encryption became insecure. 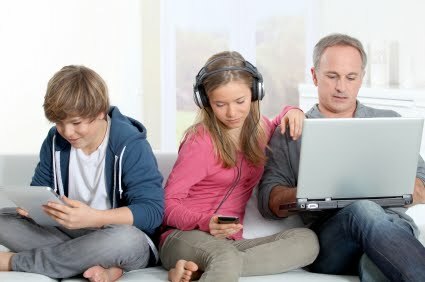 They learned to not use cell phones, and Osama Bin Laden’s home was the only one in the neighborhood without Internet. Emails could be sent encrypted with one-time pads; manual encryption codes that defy decryption and are said to be unbreakable if used properly. It would require more effort for those using it, but would leave only those of us needing encryption for good things to be using insecure encryption.